RSCC: STOP EDUCATIONAL GENOCIDE AGAINST BLACK & BROWN YOUTH! Liberate the schools! Close the prisons! RSCC: STOP EDUCATIONAL GENOCIDE AGAINST BLACK & BROWN YOUTH! Liberate the schools! Close the prisons!. The Revolutionary Student Coordinating Committee (RSCC), NYC calls on progressive youth and students to join a Contingent Against Educational Genocide for the March 1 National Day of Action for Education. Convene at 1:45 PM, Thursday, March 1 at the intersection of Duane Street and Elk Street in Manhattan near the African Burial Ground. Look for the banner that says, “STOP EDUCATIONAL GENOCIDE AGAINST BLACK & BROWN YOUTH”. We will then march to 52 Chambers Street for the start of the citywide action. Take the 4, 5, 6, J, Z trains to Chambers Street / Brooklyn Bridge-City Hall, or the R train to City Hall. Because NYC schools fail to prepare 87% of Black and Latino students for college, according to official stats. Because the NYPD arrests an average of five students everyday in school, 90% of them Black and Latino, and school policies increasingly put our youth on a pipeline into prison. Because CUNY ended open admissions, abolished remedial programs at its four-year colleges and uses standardized tests and tuition hikes to exclude poor, working-class and oppressed-nationality people. Because the NYPD murdered 18-year-old Ramarley Graham inside his own apartment in the Bronx and then detained his grandmother for five hours at the precinct. Because the NYPD conducted a record-high of more than 680,000 stop-and-frisks last year, 87% of them targeting Black and Latino people. Because the US criminal injustice system keeps about 2.5 million people behind bars and another 5 million under supervision. More Black men today are in prison, on probation, or on parole than were enslaved in 1850. We charge genocide, because the system is killing our communities with its schools, its police and its prisons. Schools are closing. Tuition is rising. Everyday, our people are disrespected in the classrooms by Eurocentric teachers and in the streets by rampaging cops. The same system that oppresses us in the hood oppresses our homelands – Puerto Rico, the Dominican Republic, Mexico, Latin America as a whole, the Philippines and many other places that suffer from US imperialism. These conditions must be put to an end. We must organize the youth and students to fight for the most dispossessed, exploited and oppressed sections of our communities. We must unite our communities to fight for survival against genocide. We must struggle for fundamental transformation led by those with nothing to lose and a world to win. Join us in a Contingent Against Educational Genocide on the March 1 National Day of Action for Education to demand an end to the killing of our communities by the schools, the police and the prisons. 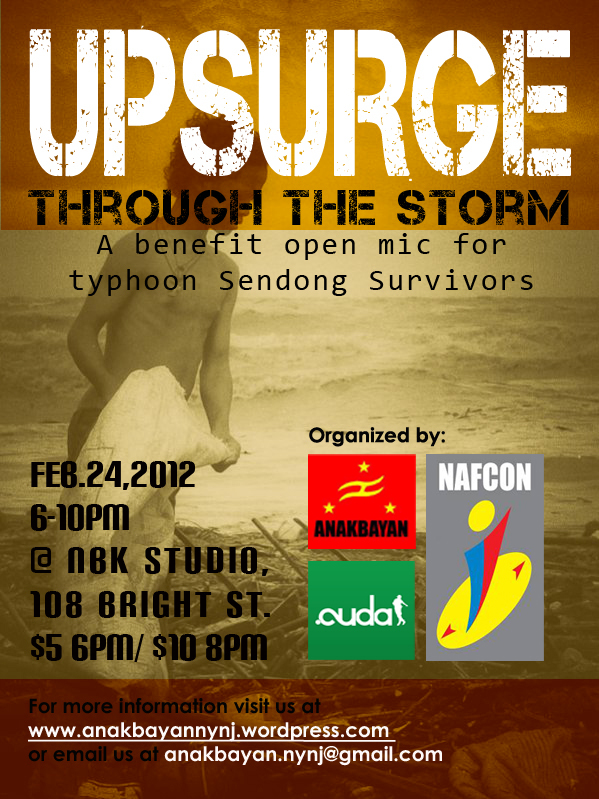 A fundraiser for survivors of Typhoon Sendong and other natural disasters in the Philippines. Proceeds will go towards Bayanihan Alay sa Sambayanan or BALSA-Mindanao, a grassroots relief effort organized by different people’s organizations, institutions and churches in Mindanao. This benefit will be a showcase of a wide range of local talent including dance, spoken word, hiphop, singing, etc. There will also be a 50/50 raffle, silent art auction, and more fun activities. B-BOYS AND B-GIRLS WANTED! There will be a dance off starting at 9pm. Thank you and spread the word! We hope to see you all there! 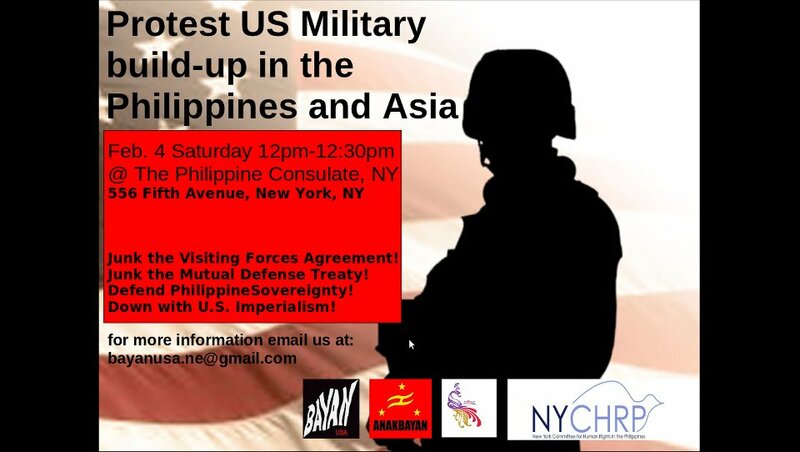 For more information, email us at anakbayan.nynj@gmail.com or call Bea Sabino (201) 779- 6886. 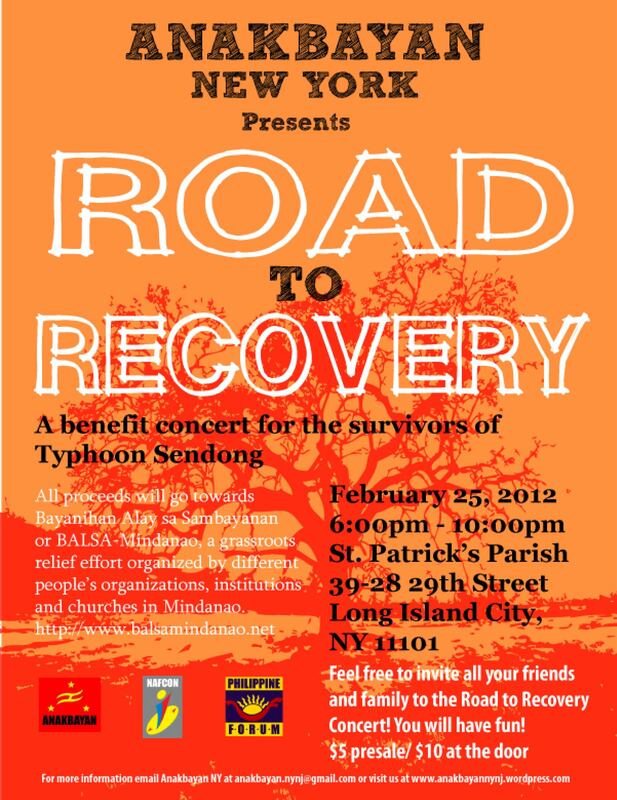 Queens, NY- Progressive youth group, Anakbayan New York, organizes “R2R: Road to Recovery” benefit concert for Typhoon Sendong survivors on Februrary 25 at St. Patrick’s Church at Long Island City. The youth group aims to raise relief funds and awareness regarding the environmental issues that affect our kababayans. R2R: Road to Recovery benefit concert is part of a national effort led by the National Alliance for Filipino Concerns’ Bayanihan Disaster Relief and Rehabilitation Program. It aims to raise funds for the typhoon survivors and, at the same time, raise critical issues around the environmental degradation that caused so much devastation and lives. All the proceeds will go towards Bulig Alang sa Mindanao or BALSA-Mindanao, a grassroots relief effort organized by different people’s organizations, institutions and churches in Mindanao. The said benefit show aims to put together a family-friendly event for the entire community to enjoy. The concert will showcase a wide range of talents from the local Filipino community. Performances include live musical performances, spoken word, and Filipino cultural dances. “As a Filipino-American, I believe it is important to stay in tune with your heritage through keeping up with current events, incorporating Filipino values and traditions in your lifestyle, and especially helping out your kababayans through community events. So I invite everyone to come to this wonderful benefit show and help out,” said Goeffrey Laurel of Anakbayan New York. R2R: Road to Recovery starts at 6pm on Feb.25, Saturday at the St. Patrick’s Parish located at 39-38 29th Street Long Island City, NY. $5 pre-sale, $10 at the door. For donations, you can make the check payable to “Philippine Forum”. 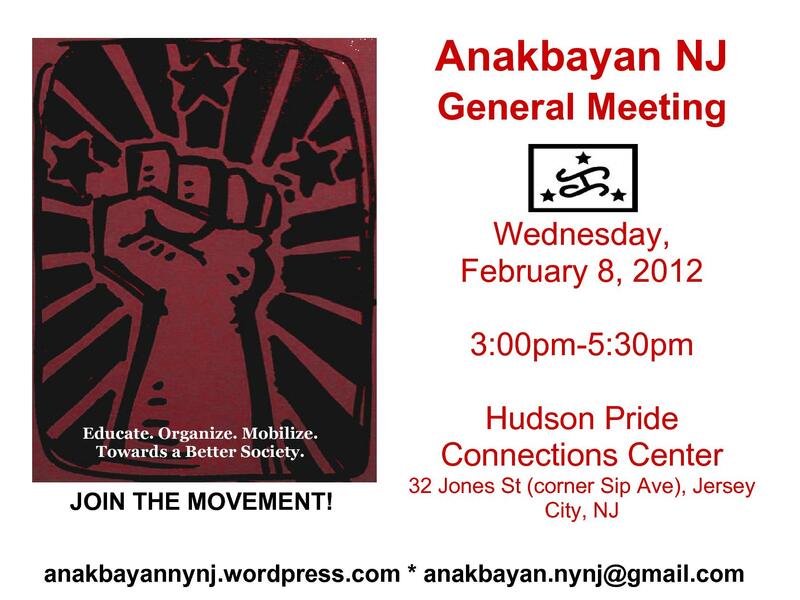 You are invited to Anakbayan NJ’s second General Meeting of the year! Just a few steps from the PATH Station. Learn more about who we are, what we do, and why we do what we do in organizing the Filipino youth community in NJ. Participate in launching the STOP Campaign, organizing fundraisers, and preparing for the historic Anakbayan USA launch in May 2012. Let’s keep this movement going! For inquiries, email anakbayan.nynj@gmail.com or contact Yves Nibungco (201) 253- 5662. 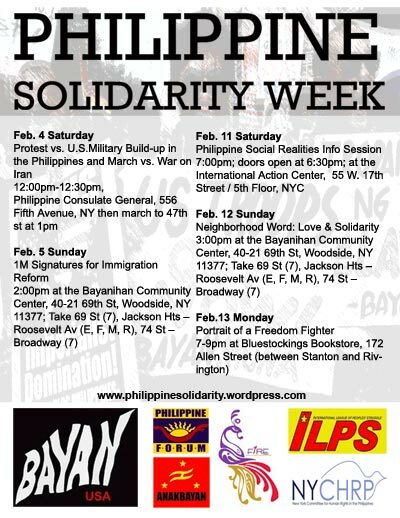 Come and check out http://www.philippinesolidarity.wordpress.com for the listing of events.